Mr. Jason Dickie's second grade class at Goshen Elementary School was the winner of the first weekly School Spirit Day contest. 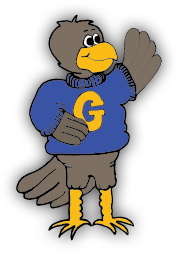 The class that wears the most of the school colors of blue or gold (yellow) wins a beautiful falcon trophy for a week. The trophy of the school mascot was created in wood by former Goshen teacher Mr. Arlin Ewell back in 1987. Josh Ward pulls rope to the bell to start the school year. School is now in session! Josh Ward, a sixth grade student from Goshen Elementary School, pulls rope to the bell in the belfry of the school to start the school year. Goshen School is celebrating its 100th year of being a school counting both buildings called Goshen School. Actually there have been other “schools” in Goshen since 1861, according to Ray Steele, local historian and author of The History of Goshen Valley. Just four years after Goshen’s founding by Phineas Cook in 1857, the old schools had slates with which to write and often seven grades in one room. When the Goshen School was built in 1910 at a cost of $20,000, it had seven classrooms with heat and indoor toilets. It also had a bell which was used to call students from all over the valley to school. The bell was brought from the old school to the new Goshen School building, constructed in 1983, and placed in the specially built belfry in the new school. To mark the 100th birthday of Goshen School, each student pulled the rope and sounded the bell. There is no question in Goshen that school is back in session!